Livestock scale: The best all around weigh bar scale is a great portable animal scale too! A large variety of livestock scales are displayed at Barn World and the most popular animal scale is certainly the weigh bars. They make an excellent cattle scale and are the best chute scales available. BarnWorld.com carries a large selection of livestock scales for all your animal scale needs. Weigh bars from Barn World offer the best chute scales in livestock scales available. Weigh bars: Barn World offers the toughest weigh bars out there! Barn World’s MTI-500 weigh bars is the toughest in the livestock scale business. This weigh bar is constructed from carbon steel and finished with a high grade epoxy paint. The digital weight indicator is for the weigh bar is made from stainless steel NEMA 4X. Barn World carries the weigh bar with your choice of 33″ or 40″ lengths and an optional scale platform. Call Barn World at (720) 238-2190 or visit BarnWorld.com today for the best weigh bars in durability and performance and all your livestock equipment. Weigh Bars from Barn World – the best chute scales and livestock scales are at Barn World! Barn World‘s MTI-500 weigh bars is the toughest in the livestock scale business. Small Animal Livestock Scale System from Barn World. A great small animal livestock scale. Small Animal Livestock Scale System from Barn World. A great small animal scale. 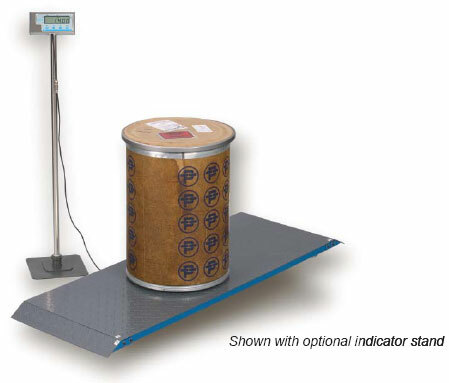 The MTI AW Series offers a convenient, compact and portable weighing capability with high capacity. This durable product offers unparalleled weighing performance, with the advantages of low profile and affordability. Standard features include lbs and kg weighing modes, hold feature, stable weight indicator and auto power off to extend battery life. I has nternal rechargeable batteries and a user instruction manual included. A rubber slip-reducing mat is included with each unit as well as a display bracket for desk or wall mounting of the indicator. Weigh Dogs, Goats, Alpacas, Grain, etc. A great alpaca scale, goat scale and even dog scale, this low profile and very portable scale is very versatile. 22″x42″ stainless steel platform scale calibrated to a digital readout. The weighing capacity is 550lbs. The scale is powered by a rechargeable batter or AC adapter. Both are included with purchase. The scale also comes with a removable rubber mat and a one-year warranty. An overall great portable, low profile and affordable scale. Visit BarnWorld.com today to view our entire selection of livestock scales, animal scales and livestock equipment. When looking for a livestock scale, look no further than Barn World. We carry a large selection of livestock scales that are great as an animal scale or weighing just about anything. Specifically the 4-H Multipurpose Livestock Scale System – PS 2000 is great all around animal scale, livestock scale or for just weighing large items up to 2,000 lbs. 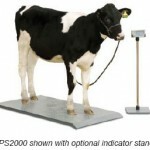 The PS2000 livestock scale is just like the PS1000 except the platform is a little bit larger. It is a 59″x30″ mild steel platform that is pre-calibrated to a digital readout. It is powered by 4 AAA batteries and includes an AC adapter. The maximum weighing capacity on this scale is 2,000 x .1 lb. Optional Indicator Stand Available. Accurate– Provides consistent accuracy within 0.1% and comes equipped with an indicator for fast digital read out. Economical to Own– There are no installation costs and no moving parts that require maintenance or adjustment. Versatile– Accomplishes a multitude of weighing jobs: livestock, pets, feed carts, bulk containers, shipping and receiving. Portable– The PS2000 weighs only 105 lbs. No need for ramps or recessed floors, as this unit comes with ramped ends. Call Barn World (720) 238-2190 or visit BarnWorld.com for all your livestock equipment needs. The PS2000 is just like the PS1000 except the platform is a little bit larger. It is a 59″x30″ mild steel platform that is pre-calibrated to a digital readout. It is powered by 4 AAA batteries and includes an AC adapter. The maximum weighing capacity on this scale is 2,000 x .1 lb. Optional Indicator Stand Available. Barn World carries many livestock scales and is featuring our hog scales and sheep scales as the best livestock scale in the industry. This animal scale is extremely durable and built using industry standard parts common in all livestock scale systems. The hog scales and sheep scales package includes an 18″x55″ aluminum platform scale, crate assembly, stainless steel digital indicator, rechargeable battery, AC adapter (charger), pre-calibration, one-year warranty. Capacities: 500lb and 1,000 lbs. Shipping is estimated based on weight and location. Accurate- Provides consistent accuracy within 0.5% and is comes complete with digital indicator and “motion control” software. Portable- All aluminum construction to maximize portability. 110 lbs. Easy to relocate. Gates are easy to lift. Low Profile- Small animals can easily step onto the scale avoiding animal stress. Durable- Complete with stainless steel, hermetically sealed load cells and a stainless steel, NEMA 4X battery-powered digital weight indicator. Built for farm use! Economical to Own- Low purchase price, virtually no maintenance cost, and economical replacement parts readily available. Call Barn World today at (720) 238-2190 or visit BarnWorld.com to order yours and view all of our livestock equipment! Construction- Aluminum with non-skid platform surface protects animals and handlers from accidental falls. Gates can be easily lifted with one hand reducing back strain. Overload Capacity- Capable of withstanding 1,500 pounds of weight without damaging the scale. Easy Assembly- No installation costs. No moving parts that require maintenance or adjustment. Stainless Steel Junction Box- allows easy connec- tion to the MTI500WB indicator. Weight Sensor- The AHS500 uses four high-quality stainless steel, hermetically sealed load cells for superior performance and durability. These load cells can be submerged in water without failing. Indicator- The Model MTI500WB provides 5,000 divisions of certified accuracy with a backlight LCD display. Comes complete with RS232 serial port for computer or printer connection. Includes rechargeable battery and AC adapter which acts as battery charger when plugged into indicator. Also includes MTI’s proprietary “motion control” software which allows you to obtain a stable weight even if the animal is continuously moving on the platform. Call Barn World at (720) 238-2190 or visit BarnWorld.com to explore our large selection of livestock scales. BarnWorld offers a great selection of livestock scales for all sizes and types of cattle. Several of our livestock scales are perfect for 4-H projects and weighing smaller animals. 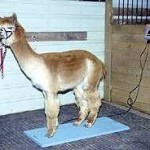 We have scales to weigh your cattle, llamas, alpacas, sheep, goats, dogs or grain. Multipurpose livestock scales weigh smaller animals including pigs, sheep, goats and calves. 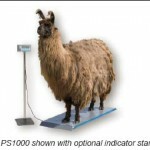 Our low-profile animal scales weigh horses and llamas. We also offer livestock scales to work under your chutes and alley ways using weigh bars for a complete cattle scale system. The Multi-Purpose Livestock Scales are perfect livestock equipment for 4H uses with 1,000 and 2,000 lbs limits. PS 1000: This multipurpose livestock scale is designed with 4-H in mind. Weigh pigs, sheep, goat, calves up to 1,000 lbs. 55.5″x20.1″ mild steel platform scale with end ramps. Pre-calibrated to a stainless steel digital indicator. Includes 6VDC rechargeable battery and AC adapter and ships free in the lower 48 states. It also has an Optional Indicator Stand Available. PS2000: The PS2000 is just like the PS1000 except the platform is a little bit larger. It is a 59″x30″ mild steel platform that is pre-calibrated to a digital readout. It is powered by 4 AAA batteries and includes an AC adapter. The maximum weighing capacity on this scale is 2,000 x .1 lb. Optional Desktop or Floor Indicator Stand Available. Low profile livestock scale package includes: 34″x84″ diamond tread aluminum platform, stainless steel digital indicator, rechargeable battery, AC adapter (charger), pre-calibration, and one-year warranty. Maximum weighing capacity 2,000 lbs. Barn World cattle scales are designed for easy loading of the cattle onto the scales with ramp ends on the platforms,platforms that are very low to the ground, and tread on the scales to keep skittish cattle from slipping and falling. Our cattle scales are portable and can be leveled to work on any surface and provide a lot of advantages over other scales. The sheep scale and hog scale Package includes 18″x55″ aluminum platform scale, crate assembly, optional side rail,stainless steel digital indicator, rechargeable battery, AC adapter (charger), pre-calibration, one-year warranty. Capacities: 500lb and 1,000 lbs. Shipping is estimated based on weight and location. 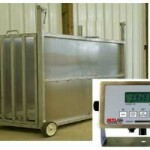 Small Livestock Scale System Weigh Dogs, Goats, Alpacas, Grain, etc. To get more information on livestock equipment, livestock scales or place an order, go to BarnWorld.com today. BarnWorld offers a great selection of livestock scales for all sizes and types of cattle. Several of our livestock scales are perfect for 4-H projects and weighing smaller animals. We have scales to weigh your cattle, llamas, alpacas, sheep, goats, dogs or grain. Multipurpose livestock scales weigh smaller animals including pigs, sheep, goats and calves. Our low-profile animal scales weigh horses and llamas. We also offer livestock scales to work under your chutes and alley ways using weigh bars for a complete cattle weighing system.